The Lanaform hair trimmer will give you a clean, smooth shave every time from the comfort of your own home. The hair clippers can be used by both men and women as they are perfect for shaving a beard and sideburns but also great to shave under the arms or legs. This allows you to evenly cut the hair of your beard and sideburns and to trim the hair on your neck, underarms and pubic region. 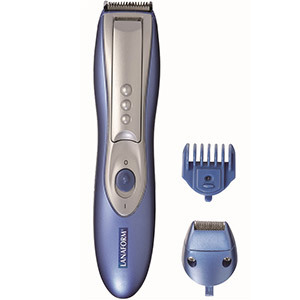 The trimmer is supplied with an adjustable clip-on comb guide. To set the guide, attach it to the front of the main blade and then clip it into position at the back. The comb guide has 5 different cutting lengths: 2mm, 4mm, 6mm, 8mm and 10mm. We suggest beginning with the maximum length until you become familiar with the different lengths obtained with each adjustable position. The trimmer can also be used without the comb guide for a closer cut. This unit is equipped with a small telescope contour trimmer. To use it, simply plug in the unit and slide the contour trimmer until it becomes locked in the forward position. When you have finished, simply put the trimmer to the back position again. This blade is used to tidy up the difficult-to-get-to areas like the ear region or even tidy up your beard. Indulge in the cordless hair clippers today for a smooth finish every time.